Welcome to my "unofficial" Carling Black Label Tribute Page, where I share my love of Carling Black Label Beer. 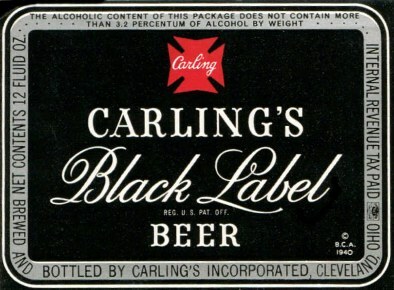 Yes, Carling Black Label....the beer your dad, mom, uncle, and grandfather drank! I hope you enjoy your visit. There is plenty to see and do on the many pages here. So, grab a beer, kick back , and enjoy! Please bookmark this page as I try to update each chance I get. If you have any comments, suggestions,"where to buy" submissions, or corrections about my site,please send me an e-mail, I would love to hear from you. Please do not write asking me what something is worth. I am a tight-wad and will not be very accurate in guessing a value. Try eBay. I'm working of a Facebook page as well. So, look up "hey mabel black label . com " on Facebook ! NOTE:This site is strictly a fan site and is in no way affiliated with Carling Black Label Beer, MillerCoors Brewing Company, Pabst Brewing Company, any of their subsidiaries, or partners. This site contains many high resolution images. 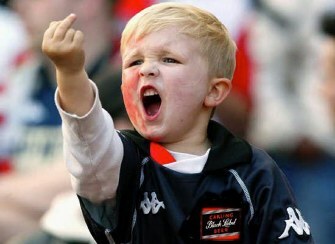 If you are using "dial up" internet, several reloads may be necessary to view all images. Good things come to those who are patient and wait it out. This site works best with a 12 pack of beer, a free afternoon, and a high speed internet connection. 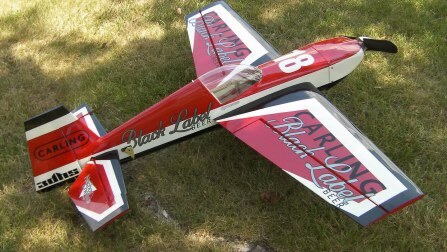 Above is Carling Black Label fan djmoose's Edge 540 remote control showplane. Thanks Moose for the pic! 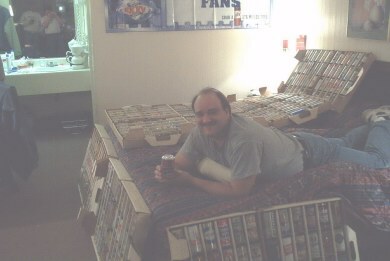 David Bonazzoli, a fellow Carling fanatic and collector, has his own web page with pictures of his collection. To view his site, go HERE ....Great job David! You obviously have great taste in beer! The not so BREAKING NEWS ! Belgian brewer Inbev has bought Anheuser- Busch creating the largest brewer as well as consumer goods company in the world. 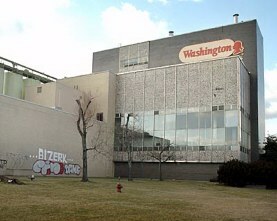 The buyout also means that the Pabst Brewing Company is now the largest U.S. owned brewing company left. Other major U.S. owned brewers left include Boston Beer Co., which brews Samuel Adams, and D.G. Yuengling & Sons. Molson-Coors of Montreal, CA & SABMiller of London, Eng. announce a joint U.S. venture. The new company is called MillerCoors and will have a corporate office in Chicago. No U.S. breweries will close and some Miller brands will be brewed at Coors breweries and some Coors brands will be brewed at Miller breweries. Coors Banquet will continue to be exclusively brewed in the Rockies at the Golden brewery ONLY. Coors(Black Label in UK) & Molson(Black Label in Canada) finalize the merger that creates the fifth largest brewer in the world behind A-B, SABMiller, Heineken & Interbrew. The new company is called Molson- Coors and is headquartered in Denver Colorado. 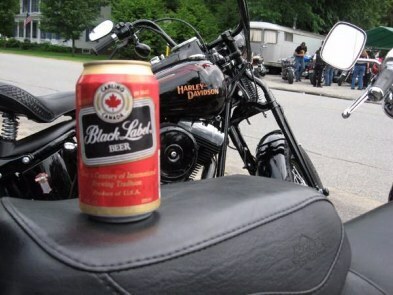 Carling Black Label wins the GOLD Medal in the 2003 Canadian Beer Awards in the American/Canadian Style Lager category ! Carling Black Label wins the GOLD MEDAL at the Canadian Brewing Awards! To Read all about it, go HERE. Carling Black Label is #1 in South Africa with a 33% market share ! Thank you Lisa for sending the pics! Dave Suffredini knows a great beer when he taste one ! 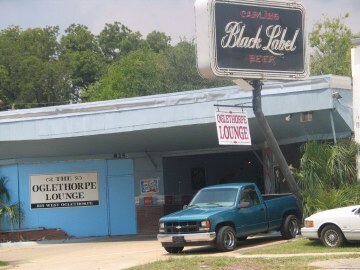 WHERE DO YOU BUY YOUR BLACK LABEL??????? not exactly meant for a low-carb diet, huh ! Do this....drink more Black Label and eat less fast food ! 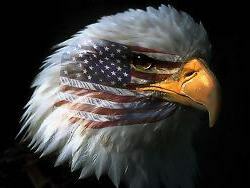 Please click on the links below to navigate throughout my site! 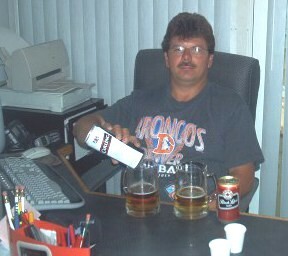 Here is your web dude doing my "international" taste test on Carling. I had recently received a can of Carling Black Label from the UK, thanks to my Ebay friend Jeffrey Mills . This is the first side by side comparison I had ever done on CBL. The British version is darker in color, but lighter in body. Aftertaste is almost identical to the US version. Aroma is identical. The hop bitterness is perfect in both. The expiration date on the US version is Oct. 21,2002. The expiration date on the UK version is Mar 31, 2003. The UK version is in a 500ml steel can from Burton-On-Trent and the US version is in a 355ml aluminum can from Eden, NC. The more I drink of the British variety, the more I can't tell a difference!...Is that a bad thing ? Definitely not! I am quite pleased that that are very similar. If anyone visiting my site is willing to ship me a version from any other part of the globe, please e-mail me. I will pay all shipping cost. 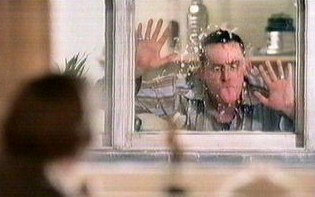 I posted the above commercial before youtube.com came into existence. For some awesome Black Label commercials, just type it into the search engine on youtube! "Friends don't let friends drive drunk"
"Know when to say when"
"Well, you see Norm,it's like this. A herd of buffalo can only move as fast as the slowest buffalo. And when the herd is hunted, it is the slowest and weakest ones at the back that get killed first. This natural selection is good for the herd as a whole, because the general speed and health of the whole group keeps improving by the regular killing of the weakest members. Remember to pray for our troops in Iraq, the Persian Gulf, and Afghanistan.The "WAR" may be over, but we still have thousands of troops there and the region is still a very volatile place. Site counter has been moved to the history page.